The bicycle began as the ultimate dream machine, cheaper, healthier, more exciting and more glamorous, than horse-drawn vehicles or horses. In the 1940s, almost half the trips in London and Copenhagen were cycled. And the figure was over was over 80% in Amsterdam. Competition from motor vehicles then began to drive bikes off the road. Commuter cycling nearly died. So did far too many cyclists. And too many transport planners prioritised motor transport – as they still do. Then, in 1961, a keen cyclist wrote a book on The Death and Life of the Great American Cities. Jane Jacobs described ‘the attrition of automobiles by cities’ as ‘probably the only means by which absolute numbers of vehicles can be cut down’. Accidents weren’t her focus. She argued that sedentary transport wastes urban space and is a serious health hazard – and she was dead right. Get a clip. Jacobs’ book had enormous influence, and in the half century since its publication the car has come to be seen as a dangerous, unhealthy, city-destroying transport mode. We should drive only when we have to. In 1973 Stop-de Kindermoord launched a political campaign that led to Amsterdam becoming the world’s cycling capital. ‘Stop Child Murder’ was a brilliant slogan. How could anybody be against it? And it includes deaths from traffic accidents, from physical inactivity, from obesity and from air pollution. Also in 1973 the first oil crisis highlighted another problem with road transport: it’s very expensive! See video How the Dutch got their cycle paths. So in the 21st century, cycling has been resurgent around the world, with Holland and Denmark still leading the way. A book called Copenhagenize explains how to encourage cycling – by building cycleways. The crucial point is that from 2000 and 4 to 2000 and 18 Copenhagen invested £35/head/year in Cycleway Networks. That’s is about the cost of 12 cups of coffee/mouth/year and it raised the proportion of all trips in Copenhagen done by bicycle, the mode share, from 20% to 42%. For most of this period London’s expenditure on cycle infrastructure was only £2/head/year, making £30 in 15 years, and this raised the mode share of cycling by 1% to 2% . You get what you pay for. The 2018 London Cycling Action Plan promises to invest about £18/head/year in cycling and walking. This is expected to raise the cycling mode share by half a percent per year, 5% in 2025. Similar increases are not planned for the rest of the UK. A United Nations report, in 2016, advised both rich and poor countries to spend a fifth of their transport budgets on NMT: Non-Motorised Transport. For the UK, this would be £91/head/year (equivalent to 30 cups of coffee per mouth per year). With £35/head buying a 1% per year increase in the cycling mode share, spending £91/head would take the London cycling mode share from 2.5% to 25% in one decade. This would transform the city. The cycleway network would require no electricity and little maintenance. It would operate 24 hours a day, with no breakdowns and no industrial action. It would free up road space for use by commercial vehicles. Cost-benefit analysis favours cycling. And this is why the UN regards cycling as such a crucial investment. Like Jane Jacobs, they’re dead right. The UK Facebook group for Stop Killing Cyclists has 7,000 members. 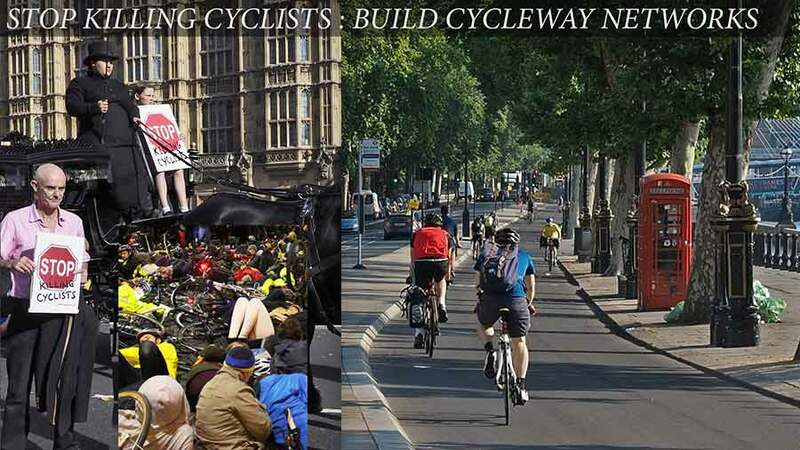 Please join and please help and please ask anyone who stands for an election in your part of the country whether they support the UN target for investment in cycling: £91 per head per year for the UK. Let’s make the country that invented the Rover Safety Bicycle into a country where cycling saves lives.